Before there were a million books, there were gloves. Before there were gloves, there were hats. Before there were hats, there were blouses. 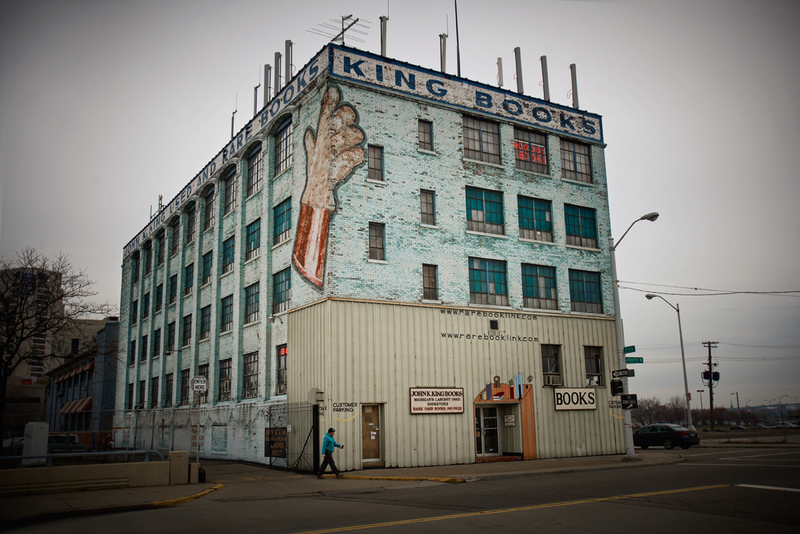 Before John K. King Used & Rare Books took up residence in the four-story building located at 901 West Lafayette Avenue, the building was home to factories for various clothing manufacturing companies. Advance Glove Company has left the only visible marks on the building, with a large glove painted on the exterior, a floor mat welcoming visitors inside the front door, and signs ordering workers “NO SMOKING” hanging above bookcases. Advance Glove acquired the Lafeyette building in the 1940s after its previous occupant, the Crown Hat Manufacturing Company went bankrupt in May 1930 like many other businesses in the Great Depression. Continuing into the building’s past, in 1908 Crown Hat took over from Ste. Claire Manufacturing Company, a maker of women’s blouses, the company for which the building was originally built in 1905. While the future home of John K. King Used & Rare Books was still in the hands of Advance Glove, construction of the M-10 freeway began in January 1947. Thousands of houses and businesses met their fate as they were destroyed in order to make room for the new road. The Advance Glove factory, however, managed to escape such a fate. The building was jacked up and rolled on logs of Alabama gum wood from the corner of Lafayette and Fourth Street to the corner of Lafayette and Fifth Street and there it has sat ever since. The two pictures below show the before and after of the blocks where the M-10 was constructed and divided the downtown and light industrial areas. After his Dearborn store ended up closing, King moved into Downtown Detroit where he set up shop in the iconic Michigan Theatre Building. While there King’s collection and stock grew exponentially. At first he rented out more empty offices to store the new books and other historical articles. But soon that was no longer a financially feasible option. And so, King began looking for another property to claim for his precious bookstore. The Advance Glove Manufacturing Company had gone bankrupt, and so vacated its Lafayette factory, in 1981. The building with its large painted glove on one corner had stood empty for a couple years by the time it caught the attention of John K. King. Its multiple stories would be perfect to house his expansive collection, and so in 1983 the property became King’s. The John K. King Used & Rare Books store we know today opened on January 1, 1984. But that wasn’t the end of expansion for John K. King. As his collection still grew, he eventually purchased the building behind the old glove factory as well. This slightly smaller structure had originally been built for the Otis Elevator Company in 1909 and then was home to an architecture firm before it ended up as part of King’s Detroit literary paradise. Now the second building serves as office space and the home for the rare books collection that requires appointments for viewing. He’s also opened up two other stores elsewhere in the Detroit metropolitan area: John King Books North in Ferndale, and Big Book Store near Wayne State University. While John K. King Used & Rare Books is a defining icon of its district today, another bookstore played an important role in West Industrial Side’s history when the zone was still part of the neighboring Corktown. In the 1950’s, Corktown encompassed the area now known as West Side Industrial but then Detroit city planners decided that part of the residential area would serve the city better as a light industrial zone. A woman named Ethel Claes led the fight of Corktown residents to fight the rezoning and save their homes. The bookstore she operated with her mother at their own home, The B.C. 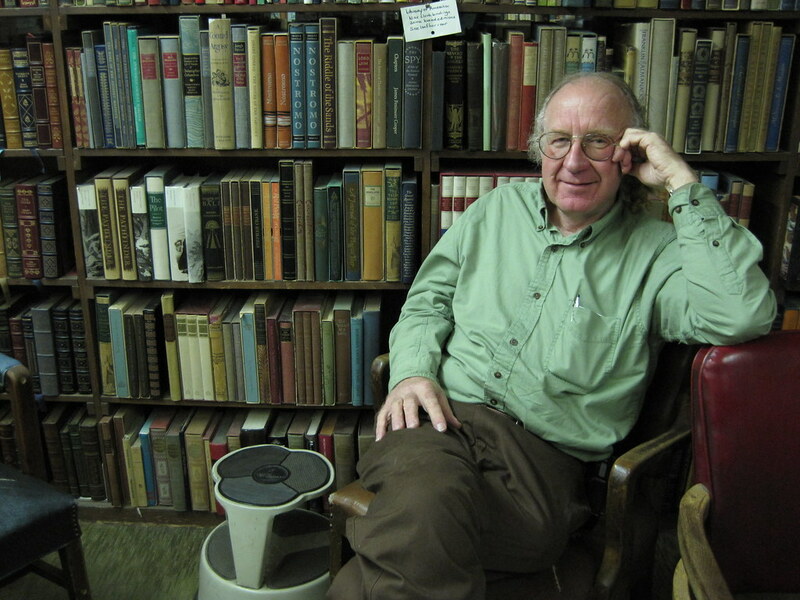 Claes Book Shop, served as a “rallying point” for the protesters in a similar fashion to how Lewis Michaux would open up his National Memorial African Bookstore as a hub for political activists of color like Malcom X in the midst of the Civil Rights Movement (Emblidge 1). These bookstores exemplify the idea of being “indigenous organization[s] that foster communal solidarity” that’s been lost due to the rise of chain bookstores and the commercial competition they’ve forced upon independent bookstores (Miller 120). As can be seen today, even though the residents of Corktown were able to reveal that the city had no hard evidence to show that Corktown was “blighted,” which served as the city council’s primary justification for rebuilding the area, Claes and Corktown lost their fight. In the late 1950’s, seventy-five acres of land were bulldozed and recreated into what is now West Side Industrial. The City of Detroit has recently taken interest in West Side Industrial again and been working on more development in the area. Just before John K. King opened his massive bookstore in an old glove factory, construction was completed on two of the Riverfront Towers just a few blocks away along the bank of the Detroit River. A decade later, the third Riverfront Tower was added, and the apartment and condominium complex was established as the left end of Detroit’s International Riverfront. In 2007, the Detroit Riverfront Conservancy purchased a twenty-acre piece of land that was once home to a newspaper printing plant and had been closed since the 1970s and developed it into the sprawling West Riverfront Park, which opened in 2014. The park is now being advertised as a venue for summer concert festivals to further the city’s attempt to “revitalize” the area. The two buildings that John K. King Rare & Used Books occupies, however, have not changed much on the outside in the past fifty years, as seen in the two photos above. Different signage grace the buildings, part of a third level has been added to the second building, and some shades have been added to a few windows on the second building as well. Besides these small details, though, the buildings on West Lafayette have been an anchor in West Side Industrial ever since they were constructed and/or moved there in the twentieth century. This remarkable bookstore is connected to various pieces of history, both its own and that of its home neighborhood. The colossal glove that preserves the memory of a factory and the vintage paint schemes and signage provide a piece of nostalgia in an area of Detroit that is receiving increasingly more attention as we enter into a brand new generation. John King Books buildings present day – street view. Google Maps Street View. Emblidge, David. “Rallying Point: Lewis Michaux’s National Memorial African Bookstore.” Springer Science+Business Media, LLC, 25 July 2008.